I had a pretty good chase today, especially for August! Two severe squall lines (actually, different segments of the same one 100 miles and 3 hours apart) and a spectacular tornado-warned right moving supercell, which it now turns out did produce a brief tornado. Here's a brief summary, along with some pictures and links to statements, warnings, and LSRs for the storms I observed. THE SETUP - An unseasonably strong shortwave trough and accompanying cold front was moving in from the northwest. A surface low had formed by late morning along or a little ahead the front near Quicy and a comma-shaped pattern of ongoing convection ran from Minnesota and Wisconsin through the Chicago area and back around to just north of Peoria. This seemed to be rotating around a mid/upper level closed low over SW Wisnconsin, SE Minnesota, or far NE Iowa. Rapid advection of warm air and moisture into the sunny warm sector south of the area of convection was increasing instability rapidly, and as the shortwave approached, shear was predicted to increase over east-central and southern IL. The RUC model was predicting EHI close to 3 over most of IL south of about a line extending east from St. Louis, with another area of high EHI near Danville. My initial plan was to wait for convection to fire just S of the STL area as predicted by both the RUC and ETA models, but when intense, tornado-warned storms popped around noon south of Peoria, along the southern edge of the area of ongoing convection, I couldn't wait. This mesoscale discussion from SPC and the tornado watch that followed also pushed me in this direction. ROUND 1 - I headed north from Edwardsville around 12:40 to intercept what, by the time I reached it, was the tail end of a squall line north of Springfield. It had begun as descrete tornado-warned cells just south of Peoria. By the time I started out, a second tornado warning had been issued. As I headed north on I-55, I could see nice backsheared towers to my NNW by the time I was about halfway to Springfield, and new tornado warnings were coming out for the area between Lincoln and Peoria. 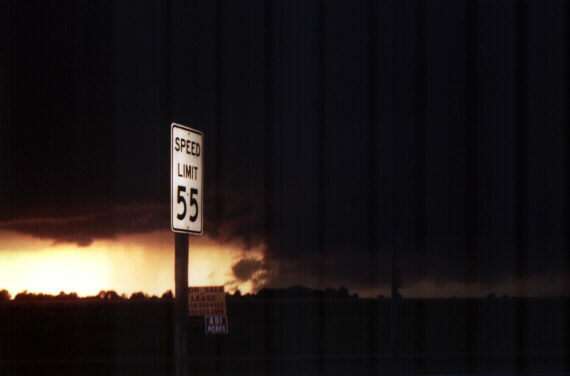 However, by the time I reached the storms just north of Springfield, they were pretty much lined out. New tornado warnings were coming out for the area to my northeast toward Bloomington, but I didn't think I could reach these tornado warned storms up the line to the NE without getting cruched by the backbuilding storms to my west. So I elected to play the tail end of the line. I decided to reposition myself west of Springfield on I-72 as a new cell formed over the city, and as I headed west, I watched yet another new updraft go up near New Berlin. It crossed the freeway just ahead of me, and I backtracked on 1400N (parallel to I-72 a mile South) as this became a mature storm and passed over Lake Springfield. 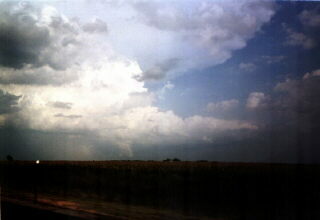 I took 55 south and exited at 104 and pursued the storm to Pawnee, as another SVR warning went out for it. Then I noticed new storms again going up to the SW. These prompted a SVR warning from the STL NWS office, and produced nickel sized hail in Farmersville; I watched the hail shafts to my south from just west of I-55. By around 4 I decided I had had enough of watching the cycle of the tail end storm moving east and being replaced by a new to its west or southwest - the storms were quickly turning outflow dominant and the only thing I had seen that resembled rotation in two hours of watching these storms was a rather intense eddy or two along the gust front while I was west of Sherman. As mentioned, when I first approached the storms, I did measure 25 mph inflow, but more and more after that, I was hit by outflow any time I let the storms get close to me. As I headed south, I did notice a very intense-looking cell to my east, which produced reports of 1.25 inch hail in Morrisonville. ROUND 2 - First on the DTN radar at the rest stop north of the Taylorville exit, then later visually, I notice very impressive descrete-cell storms to the SE of STL. As I observe nice backshearing anvil and a series of overshooting tops, with rock hard updrafts, I decide to head after these storms, which, though I did not know it, already had a SVR warning on them. After all, they were in my original forecast area, before I decided to head north and choose a known-to-be-occuring storm over a hoped-for storm. After being delayed by a poor road choice (I took 50 east from Lebanon instead of going on to I-64, because I had heard the storms were moving NE, but this one was not), I got within 10 miles or so of a spectacular supercell storm - now turning to the right and moving SE, near Nashville. Soon, the storm had another SVR warning issued for it. It displayed a series of large, scuddy lowerings under the updraft - one appeared to rotate, but I was too far away to tell for sure, playing catchup - but they did go most of the way to the ground. 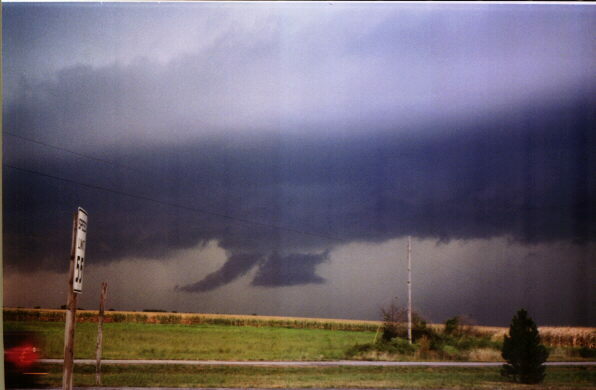 Here is a picture of the first (and probably lowest) of these lowerings, showing the whole storm structure. 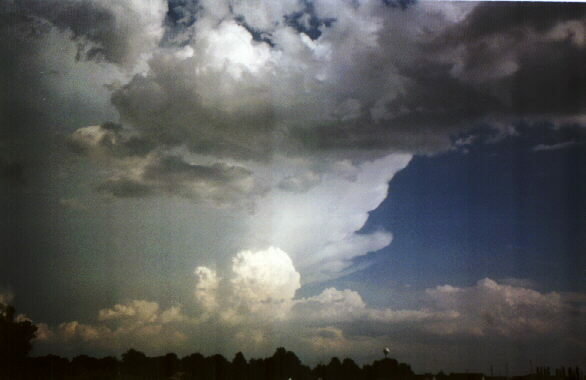 The lowering and a hailshaft to its left are both brightly lit by the sun. The storm was producing golfball hail near Nashville around this time. 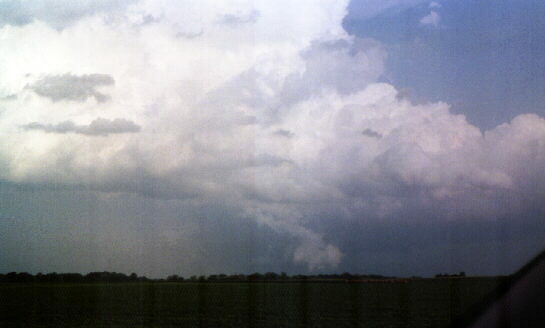 This picture, taken a minute or so later, is more zoomed, showing the scuddy nature of the lowering - but note from this picture and the previous one that it is right under, or perhaps just behind, the main updraft of this supercell. It appeared to rotate as the cloud tags closest to me moved rapidly to the right, but because I was still 10-12 miles behind the storm I could not see beyond these to be sure what the other side of the lowering was doing, so I can not say for sure that it rotated. Here is a radar image from 5:30, which was slightly after the time these pictures were taken. The storm is showing clear supercell characteristics at this time, with something of a hook echo and reflectivity above 60 dbz. This storm produced a path of hail from Nashville to Ina, with reports of golfball hail at a number of points along this path. By the time I reached Nashville, the storm was maybe 10 miles southeast of there, still staying ahead of me, but evidence of it could be seen in nearly-overflowing ditches and leaves stripped from the trees by the hail. I took route 15 east from Nashville toward Ashley, and shortly before 6 I heard this tornado warning for Jefferson Co. when rotation was detected by NEXRAD to the west of Waltonville. A split second later, the "gasoline low" light came on in may car, and I knew I would have to stop in Ashley for the gas-up I had been delaying trying to catch up with the storm. Luckly I didn't drive through the huge pool of water in the gas station's lot, because when a pickup truck did while I was filling up, the water was over its bumper and floor level! I quickly gassed up and was on my way again. I now hear a report that radar continues to indicate strong rotation just south of Waltonville, now about 7 or 8 miles to my southeast. Below are three radar images of this storm from just after the TOR was issued. Note the intense couplet on the two velocity images, with particularly intense velocities on the rear flank, equally visible on the STL and PAH radar scans. Velocity image from Paducah Nexrad, 6:02 p.m. - Notice the velocity couplet at the lower left (southwest) edge of the storm, with particularly intense (over 50 knots) inbound wind detected. Velocity image from St. Louis Nexrad, 6:01 p.m. - Here the velocity couplet is even more evident, but since the radar is in the opposite direction, what was inbound is now outbound, and vice versa. Here, both inbound and outbound speeds are over 50 knots, indicating over 100 knots of gate-to-gate shear. This can be seen a little better in this enlargement of the image, though it is a little blurred. But you can see the bright red area (over 50 knots outbound) directly adjacent to the smaller dark blue area (over 50 knots inbound) immediately to its northeast. When I initially wrote this chase report, I wrote the following: "Seeing these radar images, I am amazed this storm did not produce a tornado. The radar suggests a very strong RFD, and my own observation of damage when I turned south from 15 toward Waltonville supported this. I turned south at the Waltonville Rd. sign a couple miles into Jefferson Co. on route 15. This road T-intersects with the westward extension of route 148 about 3 miles west of Waltonville. As I headed south, I crossed an area of wind damage - mostly trees and branches down and lawn furniture thrown around, though there may have been some structural damage, too - it is hard to tell this sometimes in southern Illinois where damaged and collapsed buildings are sometimes left that way for some time. Also, there were a lot of leaves stripped from trees by hail. When I turned east toward Waltonville, I again encountered trees and branches down from about a mile west of town into the west edge of town - and again, leaves stripped by hail. It appears that this path follows the path of the meso pretty closely, so the wind damage cound have been from RFD wind." Well, it now turns out, per NWS Paducah damage survey, that the storm DID produce a tornado (a very brief F0, right at the time of the radar images above), and also that most of the wind damage was caused by RFD winds, as I suspected. A copy of the damage survey can be seen here. I followed the storm east from Waltonville, stopping a couple miles east of there to videotape the storm, and captured what may have been a funnel cloud. As this video capture shows, it certainly looks like a funnel. However, I was still at least 5 miles from the storm, probably more, and had poor contrast, so cannot say for sure if there was rotation. I have looked at the video several times, and the feature is only visible for a couple seconds because it becomes obscured by some scud that rises and moves across in front of it - but it does look a lot like a funnel. And given what is now NWS confirmation of a tornado SSE of Waltonville, it is possible that this funnel is what was left of the tornado, or perhaps another funnel that formed from the same meso. 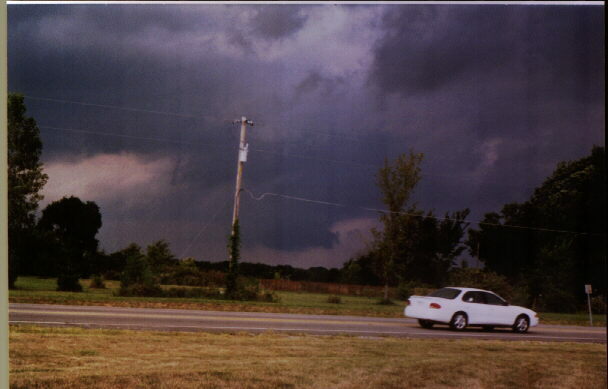 I believe the time I observed the funnel was about 20 minutes after the time of the tornado. This was about the time the storm produced golfball hail in Ina. I lost the storm a little farther east of Waltonville when it crossed Rend Lake to the SE and I did not have a place to do that! Instead, route 148 took me northeast to Mt. Vernon to get around the lake, ending any possibility of further persuit. This was one of the prettiest supercells I have ever seen in Illinois. It still looked awesome a half-hour later from Mt. Vernon as it continued to the southeast, although radar images indicate that it weakened somewhat after it moved out of Jefferson Co. to the southeast. This local storm report from the STL NWS office shows the intensity of this storm - all of the reports in red between 4:30 and 6 p.m. are for this storm. The storm also resulted in this report and this one from the Paducah NWS office. Also, a Web page on this storm from the Paducah NWS office can be found here. ROUND 3 - Heading home on I-64 after a fast food stop in Mt. Vernon, I noticed brightly-lit towers to my left from another isolated storm that has gone up over Jefferson County, almost in the same area the first one had passed over. Though this storm was beautiful to behold, I was more focused on what was ahead of me. I was about to encounter a vicious-looking squall line (a southeastward extension of the earlier central IL line, which had moved east into Indiana and east-central IL). I stopped at U.S. 51 and observe more scuddy lowerings under an updraft at a break in the line, along with a two brief, non-rotating lowerings that looked like wall clouds but were probably more related to outflow, and loads of lightning. 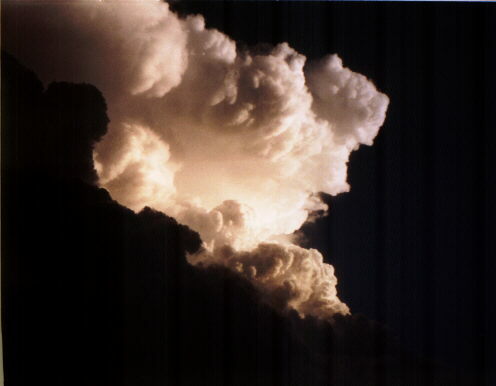 The first lowering, shown here, was brilliantly backlit by the lowering sun; the other appeared, partly hidden in rain, a couple miles to the north. 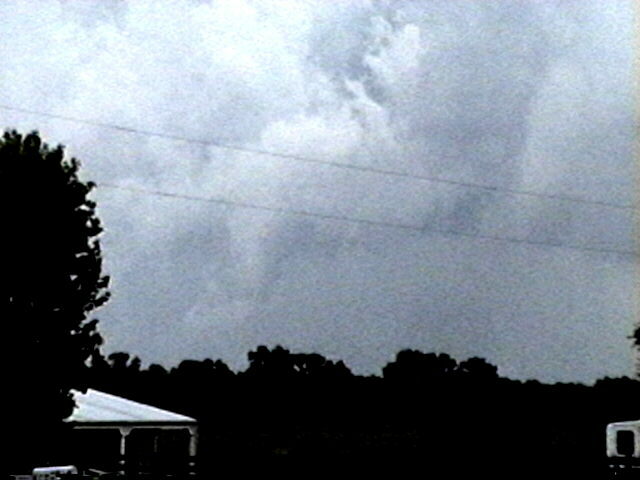 The storm also produced this funnel look-alike. This is the kind of thing that sometimes gets incorrectly reported as a funnel cloud; this was not because 1) it was not attached to the parent cloud and 2) it was not rotating. I watched the storm here for perhaps 20 minutes, during which time it produced wind damage about 10 miles to my north and dime size hail about 5 miles to my north. These reports can be seen in the LSR from STL linked above, and a radar image of the storm can be seen here. Note that there is a gap in the line northwest of Mt. Vernon; this is the backlit area lit by the sun to the left of the lowering in the picture above. 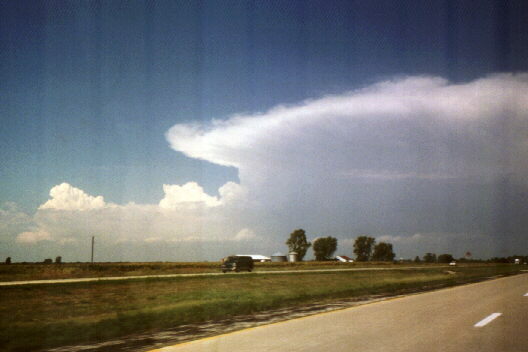 The new isolated storm over Jefferson Co. can also be seen in this picture, SW of Mt. Vernon. This was the only other place I saw any other chasers all day, though I did see a few spotters. The setting sun in the west gave a bright orange hue to the area under the RFB between the two cells, and backlit the lowerings very nicely. However, when the space between the cells - both of which had severe warnings and produced reports of wind damage - began to fill in, I decided it was time to head home. My wife (who did not go with me today) and I enjoyed the lightning show in the southeast as we went out for ice cream after the chase. She did not believe me when I said the storms were at least 80 miles away by then, and the way they lit up the southeast sky, I can see why. But a check of the radar revealed that the closest storm by then was over Carbondale, over 90 miles away. As always I am interested in hearing from other chasers who were on this storm, and in any comments you might have. If either apply, please email me. Added 9/4/01! Another chaser on this storm was Richard Thies. He was on the opposite side of the storm, and saw a spectacular "mothership" meso from his perspective. You can view his chase report, with pictures, here.